Is a Hybrid Car Economically Rational? — Auto Expert by John Cadogan - save thousands on your next new car! Is a Hybrid Car Economically Rational? If you’re in the market for a 'green' car, is hybrid the way to go? Does the fuel you save from driving a hybrid save you money, or just cut your emissions? It’s been well over a decade since the debut of the hybrid car – and prices have come down in real terms. Does ticking the ‘green’ box today guarantee you’ll save both fuel (and therefore CO2) and money? Let’s compare three similar, affordable cars and find out. Hybrids capture some of the energy used in braking, convert it into electricity, then store it in a battery. This way it can be used later for propulsion. Hybrids work well in city driving where there is a lot of stopping and starting, but they’re less effective in country driving where there is more constant-speed running. Diesels use higher compression to allow the burning fuel mixture to expand through a greater range, which is why they are fundamentally more efficient than petrols. Often you can get more than 1000km from a tank of diesel in a modern car. Diesels also generally have particle filters that require regular highway running to regenerate properly. If you don’t do that, the computer might force the engine into ‘limp home’ mode – which requires a trip to the dealership to reset. Five-year ownership term. Seven per cent finance (fully financed, based on rrp). Insurance: online quote (Allianz); all variables constant across the three quotes. Retained value: Sourced using five-year old models on www.redbook.com.au. Average trade-in price at five years divided by rrp equals retained value, applied as a percentage to the rrp of the vehicles analysed here. Fuel: Official consumption times 15,000 kilometres per year times 156.9 cents per litre for 95 RON premium unleaded (Prius), 150.2 cents per litre for the regular unleaded (Corolla) 149.2 cents per litre for diesel (Golf). Service: Prices can’t be fixed under Australian law, so standard service costs are estimates. Call it $600 annually for the Prius and the Corolla, and $800 annually for the Golf (diesels cost slightly more to service). Non-standard servicing items wasn’t analysed here (if you drive hard and wear out the brakes and tyres early). Petrol versus diesel is probably a decision based on how you’ll use the car., If you’re stuck in a congested city nearly all the time, the petrol is a real advantage. (It doesn’t have a particle filter and doesn’t ever go into ‘limp home’ mode if you don’t let it off the chain.) At Just $3 a week difference, economics isn’t going to determine which one you buy. 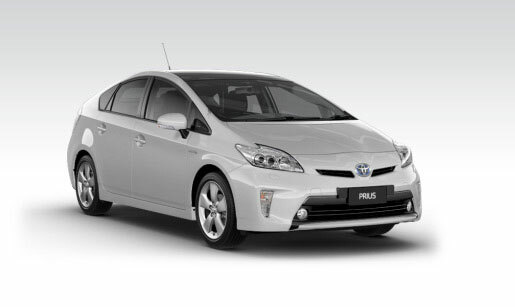 The Prius costs less than $20 per week extra, which is hardly extortionate. Certainly it’s affordable for many. You’ll cut about 2500kg of CO2 from your emissions over the five years you own it, compared with the other pair (in broad terms). So, hybrids still aren’t economically rational, but maybe they’re getting there. They won’t save you any money at all, but the cost of cutting those emissions is about $4000 – that’s $1600 per tonne, which is several orders of magnitude greater than the carbon price under any prevailing emissions trading scheme.